Since 1999, Dannmar has been setting the standard in the automotive service industry. Their commitment to excellence is the reason for many shops getting their work done safely and on time. Professionals across the country trust Dannmar car lifts to perform all types of services. We invite you to explore our selection and find the ideal choice for your shop! Here in our selection of Dannmar car lifts, we have the best variety you will find today. That includes a weight capacity from 6,000 to 12,000 pounds, to easily meet your needs. This is ideal for shops that work on all types of small to large vehicles, offering anything from simple to complex services. You can easily get the cars in the position you need, to get any task accomplished in a quick, timely manner. Our lifts are easy to set up and operate and will provide your employees an efficient operation that they can count on. They are made from steel casters that are strong and durable, heavy duty steel locks that easily keep the lift in place without damaging the vehicle, and adjustable arm assemblies to meet your specific needs. Many of our options are also easy to set up and disassemble, so they can fit in practically any space. Whether you’re looking for a hydraulic power system that is easy to operate or one you can set up and operate yourself, we have the best of both worlds. All Dannmar car lifts come with many useful features to help you get the most out of your lift. That includes a single safety lock release handle for improved safety, as well as rugged steel construction to last a lifetime. 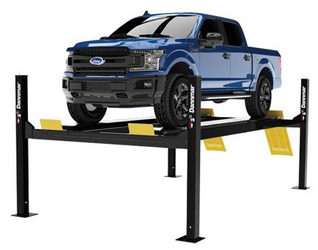 We have everything you need for added strength and safety, so you can feel comfortable working under any of our Dannmar car lifts! All of our options are ideal for any mechanic shops, and we offer them at the best value here at Best Buy Auto Equipment. Combine that with our friendly customer service, and extensive selections, and you get something special. Don’t waste your time looking anywhere else, shop with us today!